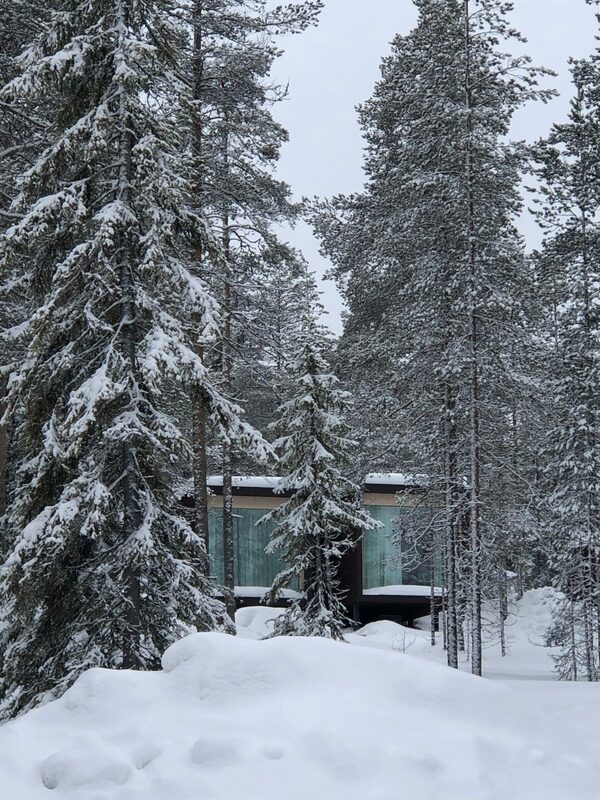 I thought I’d review this one whilst the crunch of the snow is still fresh in my head; it’s the Arctic Treehouse hotel and rather a different affair to the little London rooms I’ve been trying out recently. Actually, in terms of room size, not so very different, I suppose, but the Arctic Circle location is wildly exciting and there’s a piece de resistance in the room that really seals the deal when it comes to spectacular views. I was toying with the idea about going to Lapland last Christmas but couldn’t quite decide whether it would be magical or dreadful; did I want to go there with two small children and queue up to see Santa in temperatures so cold that my nose hairs would freeze? Were the kids too young to appreciate it? Would we get there and find that Santa World (TM) was basically like an IKEA warehouse with elves in, a huge queue of parents drunk on mulled wine snaking their way around the cavernous, echoing space whilst children swung between wildly different moods and nerve-shattering music piped in from speakers in the ceilings? I still can’t answer that actually, because I didn’t end up going to Lapland en famille; instead I was there on a press trip with the beauty brand Lumene. Seeing Santa wasn’t on the agenda, but we did drive past Santa Claus Village and thankfully it seemed to be more Disney than IKEA. Appropriately…red. From outside the high, inpenetrable walls I could just about see turrets inside, though they were a bit like the guard towers that prison snipers sit atop, waiting to shoot at escaped convicts, so who knows what goes on in there. 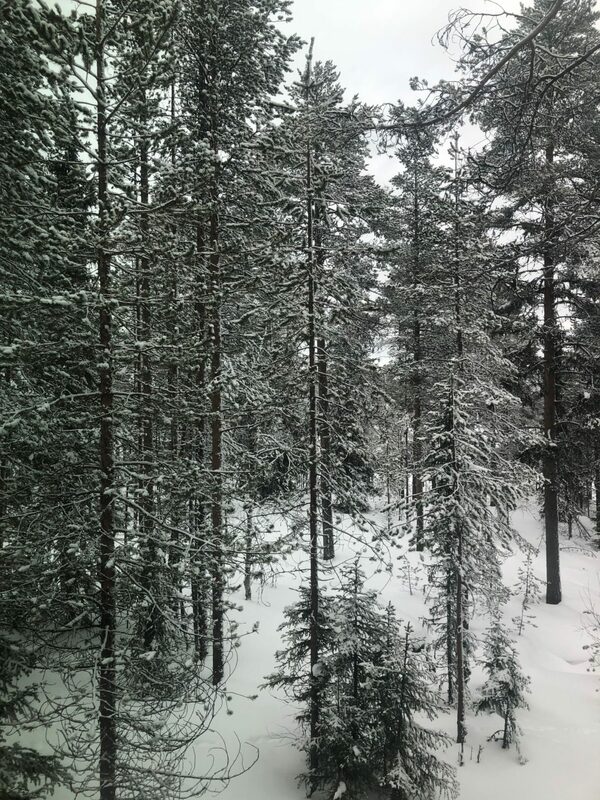 Anyway, after a couple of wonderful days in the (very powdery) Rovaniemi snow, I did decide that my own children were probably too young for Lapland and an Arctic Santa visit. For a start, getting them into the snow gear would take about a week, then they’d need a wee, the whole thing would be a nightmare. I’m imposing a ban until 2021. I’ve gone off piste – quite literally! 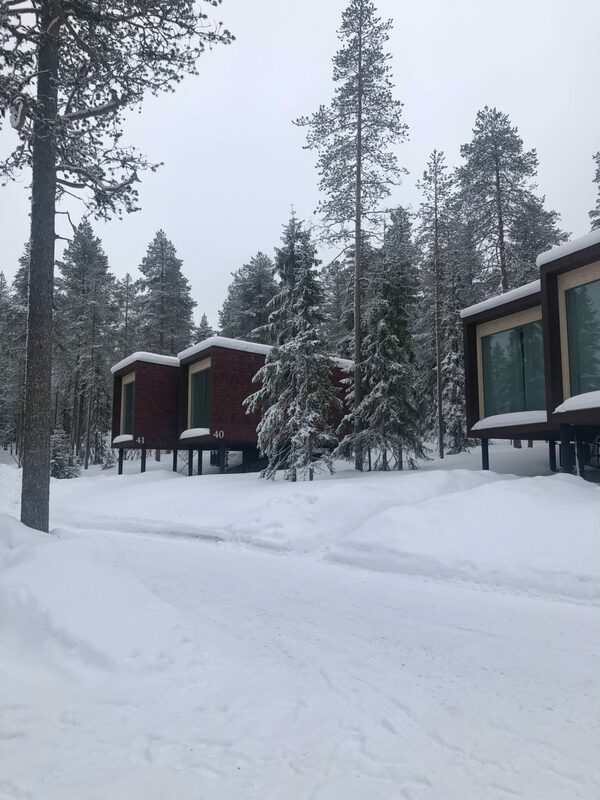 – because I was just going to keep this review short and sweet and give anyone, if they were thinking of booking a Lapland trip, a few pointers. 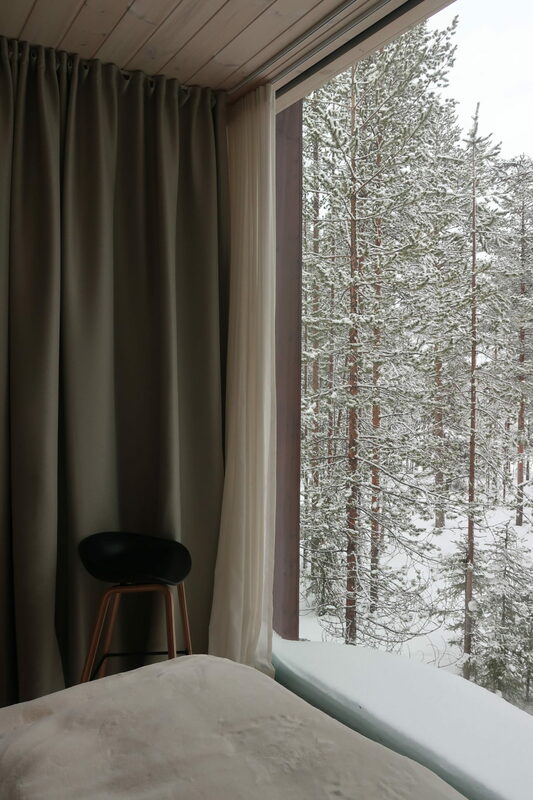 I am by no means a Rovaniemi expert from my 48 hours there, but an evening pottering on Google tells me that this is one of the best (if not the best) hotel there. Purely for its simple – yet genius – design. The Arctic Treehouse Hotel is formed of a main hub – in which there’s a reception and excellent restaurant, as well as a shop selling furry snow gear that’s straight out of Frozen – and then, across the forested grounds, pairs of stilted treehouse suites with wooden cladding and enormous windows. They rise out of the snow on their legs like sixties prefabs, except the coolest prefabs you’ve ever laid eyes on. And it’s those huge windows that make this the hotel to stay at; basically the whole end of the long room is glass, meaning that your entire view is of snowy forest. It’s absolutely beautiful. The furnishings inside the treehouse are simple but feel luxe with their mix of textures (furry chairs, pale blonde wood, brass lampshades on the night lights) and the houses are equipped with most things you need (wine, tea and coffee, underfloor heating in the bathroom and hallway) but none of it really matters much, because all you do is stare, open-mouthed, out of the window. It’s not even really as though you’re staring out of the window, because the view from the window engulfs you, especially if you’re lying on the bed. It’s not a view you need to search for – you’re right there, in the forest, getting freaked out because you’re imagining tall demons hiding behind the thin trees. Now because of this view, this glorious unspoilt view, I have a massive tip for you: only book one of the treehouses that’s on the front row. I was in 50, and I think that there were around ten treehouses on my row – from 42 to 52 – but please don’t take that as gospel. Anyway, the reason I say this is that the other rows have rows of treehouses in front of them and so you don’t get quite the same view at all. I would hazard a guess that most of the hotel pictures and images online have been taken from that front row – I had a good poke around, and maybe some further up the hillside would be similar, but nothing beats being right up close and personal. Unadulterated vistas. Look, I’m not saying that other treehouses would be rubbish – they’re all lovely, hidden away in the trees – but after my rudimentary recce of the place I would definitely be requesting one of the rooms 42-52 if I could help it. Oh wow, I’ve just had a little look online at something called the “executive suite”; whereas the normal treehouse has a double bed, a little fridge/kettle area and then a tiny but perfectly formed shower room, the executive suite has (wait for it!) a separate lounge with a sofa bed that sleeps another three, two bathrooms and a wellness area with a bath, makeup area and sauna with a view! I mean that would be the one to go for if you were in Lapland with two small kids who could nest up on the sofa bed. Jackanory. Mind you, it’s over twice the price, so it would need to be one of those “lifetime treats”. If you were booking for tonight then the standard one would be 694€ for the night and the executive would be 1409€. I’ve just seen that there’s another option, which has even more room but (oddly) costs less; two proper bedrooms and a lounge that sleeps another two, real fireplace, sauna and deck area with amazing views. The glasshouse cabin is yours for 1344€. That’s if you go tonight, so better get your skates on. What else can I tell you? The restaurant is just excellent – I had the freshest, most delicious seafood I think I’ve ever had. And the water is the most pure water in the world (according to UNESCO), so you can drink it straight from the tap. And the salmon – the bloody salmon! It’s amazing! I had it in various ways (sounds rude, shouldn’t) for breakfast, lunch and dinner. If I lived in Lapland I would be the healthiest person alive. Any downsides to the hotel? No onsite spa or guest sauna – it’s a twenty minute drive away. If I was being really nitpicky – which I am, ask Mr AMR – then I’d say that you’re far from being absolutely in the middle of nowhere as there’s a busyish road around half a mile away. But that’s it. I’m surprised that they don’t have a spa or sauna onsite, maybe they’ll add one. I’m not usually fussed about that kind of thing – if there’s a spa then I feel obliged to use it rather than drink wine wearing just my pants – but it’s curious. And that’s it. No real downsides. The cocktails are marvellous, the food is exemplary, breakfast is just a whacking great feast of stuff that tastes amazing but is better for you than a week at one of those absurd health camps, but it’s the view – the VIEW, people – that steals the show. So if you’re braving Santa’s grotto then I can highly recommend this as a place to stay – it’s a hell of a lot more expensive than most of the other options, and I imagine the price rises steeply around Christmastime – but wow. Instagram fodder if I ever did see it. Unfortunately I hardly have any pictures of the treehouse itself, mainly because I spent most of my time at the hotel dicking about in a leotard and snow boots, trying to do a funky picture for my social media (see above – I’m smiling but so, so cold inside). What I do have, however, is a video – a room tour – so if you fancy a first-hand trot around a Treehouse Double Suite then press play below! You can find out more about the treehouse hotel on their website here. Ah yeah the lock in Finland is a bit different to other places I visited. Usually on the side of the door there’s a tiny round button thingy which you can switch up and down, most of the time it’s up so you can close the door and push (or pull, in this case) a bit until you hear a click. After that it’s locked and you can only open the door by turning the round thing on the door from your side. If you turn the handle (not the round thing) and the door doesn’t open then it means people can’t open from outside either. Generally Finland is quite safe but I understand what you mean by being female and traveling alone. Maybe you can join the Rent a Finn that the government is organizing at the moment? “If you are selected, you will travel to Finland this summer (2019) for three days. You can apply alone, with a friend or as a family. The dates can vary depending on the host. There won’t be any expenses from travel or accommodation during your stay with the host. You will be accommodated by the Finnish hosts, typically at their home or summer cottage. You will also be filmed during your visit, and the material will be used in Visit Finland’s communication and advertising.” I think you will get to know about Finland and our way a bit better, and Finnish summer has its own special charm to enjoy too. Frozen nose hairs…ha ha! You get straight to the point. I hate them with every breath I take. Beautiful photos and lovely video Ruth. I think it would be a dream to stay there. Also, I thought I was the only one that stressed out about hotel door locks. Once I was staying in a hotel with the keyless card entry doors and in the middle of the night the door was opened by another guest with the help of a staff person.! They apparently were trying to get in thinking it was their room and then got help from staff. Thankfully I was with my husband at the time otherwise I would have stayed awake watching the door for the rest of the night. We debated the same thing regarding visiting the snowy North with two children, but as mine are just about a year older than yours are (5 and 3 by last month), we decided to wait a little longer too. Just remember to go before they are 13 and bored of their minds by anything you offer for entertainment anyway. I wonder where the sweet spot might be, 8 and 10 perhaps? This place looks awesome!! My husband would love for us to stay there sometime! It just looks so beautiful! I’d love you to do a video about packing for your Lapland trip…..what to wear, skincare etc because it would really be a normal packing excercise I suspect. So.many.layers! Now I want to book a trip and visit Santa…..
That should read…..wouldn’t be a normal packing excercise btw! Looks lovely! I’ve never hesitated to travel alone, especially since my husband passed away, because who wants to reach the end and regret not seeing what’s outside a small radius? Last week’s New York Times published an article ominously titled “Adventurous. Alone. Attacked.” … pretty scary stuff about women traveling alone. Not enough to stop me, but a reminder that it’s a good thing to be obsessively careful and travel with a door stop. From Santa to prison snipers – omg, Ruth, you KILL ME!! Hahahaha…just the best blog on the ‘net. This place looks absolutely bloody stunning, I would love to go there! You are so funny! I love your writing and your delivery. You should write a novel. Great post Ruth! Beautifully peaceful location. But I totally agree with your comments on Hotel Door Locks! I usually use the old Chair-Against-The-Door trick but obviously that doesn’t work in your tree house accommodation! !